While we eat it as a starter or lunch, to make this more of a main dish for dinner, we often add our favorite proteins (like leftover turkey or chicken) and some grains such as Quinoa or brown rice. It’s bright, colorful and loaded with all kinds of vegetables (and you can easily sub in whatever veggies you like or have on hand). 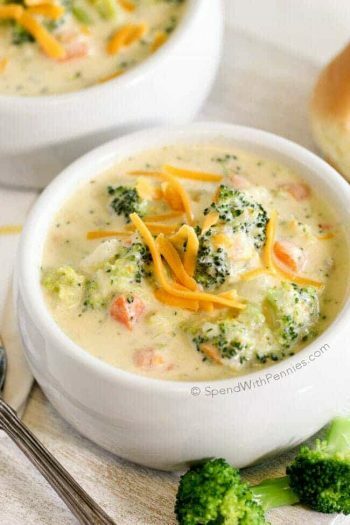 Of course, this soup isn’t the magic weight loss secret but if you’re trying to cut calories this is perfect to have in your fridge ready to enjoy when you need a snack or a quick meal! 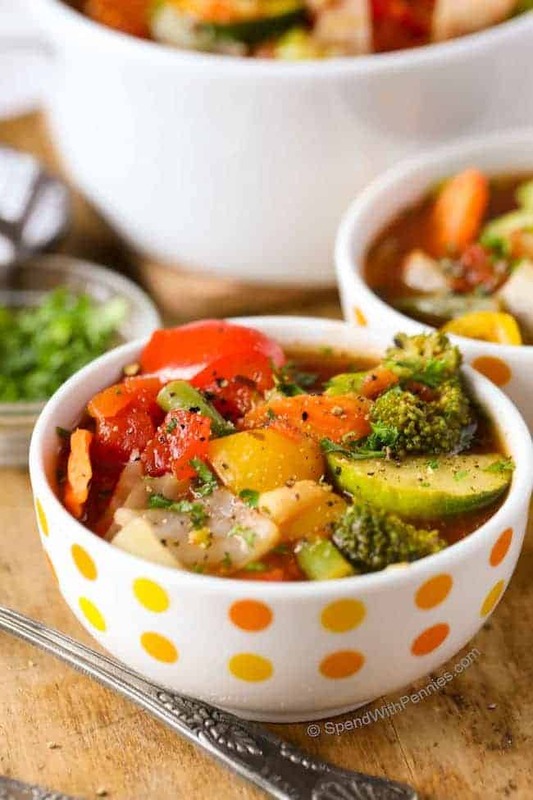 Vegetable soup is not only loaded with flavor, it fills your belly and is naturally low in calories and fat. When we are trying to cut back (usually in January after the holidays) we enjoy a small bowl of this vegetable soup before each meal. (And if you follow Weight Watchers, this is a 0 point soup… a freebie and it’s 21 day fix approved) or I use it as a snack to tide me over until dinner. I love cabbage in this soup, it adds bulk and fills your belly. If you’re not a fan of cabbage, you can most certainly substitute kale or spinach. Keep in mind that kale will add more bulk and spinach will shrink down quite a bit. If you want to make this into a main course, you can add leftover chicken or turkey or even ground turkey along with cooked brown rice, quinoa or even whole wheat noodles. Add in any veggie you like. I sometimes make this to use up vegetables in the fridge and if you happen to have roasted veggies, they add an amazing flavor too. It’s very versatile and you can swap or add any veggie to make this to your liking or swap beef broth for chicken. This is NOT medical advice. This recipe is provided for informational purposes and enjoyment only. Eating this soup doesn’t guarantee weight loss. Before starting any weight loss program, be sure to consult your doctor. NOTE: Nutritional information auto-generated and is based on the quantities, amounts, and brands of products I used in this recipe. Actual amounts may vary based on your preparation and products used. Informational purposes only, this is not medical information or advice. I LOVE THIS SOUP! I make it roughly as written, but add any lower carb veggies I have lying around, like more green beans, etc. Sometimes I throw in turkey meat balls, a can of beans, or shredded chicken for more protein, or tomatoes with chiles, for extra kick, or some frozen mixed veggies for variety. It is so good that even my kids love it. It is so good that I like to eat it for breakfast! And no problem to eat 2 servings, as it’s so low in calories, and very healthy and filling. I love that this soup is so versatile! Happy to hear how much you love the soup Danielle! Hi I’m wondering why it says it has 14 servings and 1 being approx.1 cup per serving but there are only 6 cups of liquid and the liquid from the canned tomatoes, is this just a really hearty veg soup without much broth? Am I missing something? Hi! The serving size includes the vegetables and other ingredients in the soup, not just the liquid. Hope this helps! A great bowl of vegetable soup! I love cabbage so that definitely went in the pot but only used one red pepper and not two. Added lemon pepper along with freshly ground black pepper and petite diced tomatoes. Had a bowl of this for lunch for a couple days and it did fill me up so I wasnt snacking after breakfast and before supper. Not sure if I lost any weight but it sure was good. Made and reviewed for the What’s On The Menu recipe tag game. Glad you loved the soup Lori! We love it too Kamal! Can you use this recipe in a slow cooker? Hello, if I was going to use chicken how would I season it and at what time should I put the chicken in. I would make a baked chicken recipe or use rotisserie chicken. As the chicken is already cooked and just needs heating, I would add it in the last 5 minutes to heat through. Enjoy! How much is (1) serving? Sounds good soup. Each serving is approximately one cup of soup. Enjoy Sandi! Could this be a slow cooker soup? I have made it and lived the flavor, some of the veggies were still a little crisp for how I usually like my soups. I was wondering if throwing everything in the crock pot for 3-4hrs on low might make for more tender veggies? I haven’t tried this in the slow cooker however I’m sure it would work just fine. I would suggest adding the zucchini and broccoli about 30 minutes before serving so they don’t get mushy. Other readers have made it in the crock pot with success! Very yummy and filling recipe. This is now regular for my regular diet chart. We love this soup too. So happy it’ll be on your regular rotation! Very yummy and filling!!! Made a double batch so I could freeze some extra. This is now part of my regular rotation for soups. So happy to hear you love one of my very favorite soups Lisa! Hooray! This is so good. I’ve been eating the traditional Cabbage Soup Diet soup, and while it’s good it lacks a hardiness I was needing. This is awesome. Low calorie and so flavorful. I’m keeping this recipe. Thanks for posting. I am so glad you love it Gloria! I made this today & it is fantastic! I’ll definitely make it again. I think it’s a great recipe that you can easily add or omit whichever vegetables you like or don’t like. Thanks for posting it! Are the onion and garlic to be cooked in oil or water? I use a non stick pan, so I don’t use anything to start the onions and garlic. However you can use a little water if you like. I made this once with a few tweaks, and it was delicious! Never thought I’d like cabbage or broccoli in a tomato soup, but it was so good! I want to make it again with noodles & beef (need some protein for my husband). 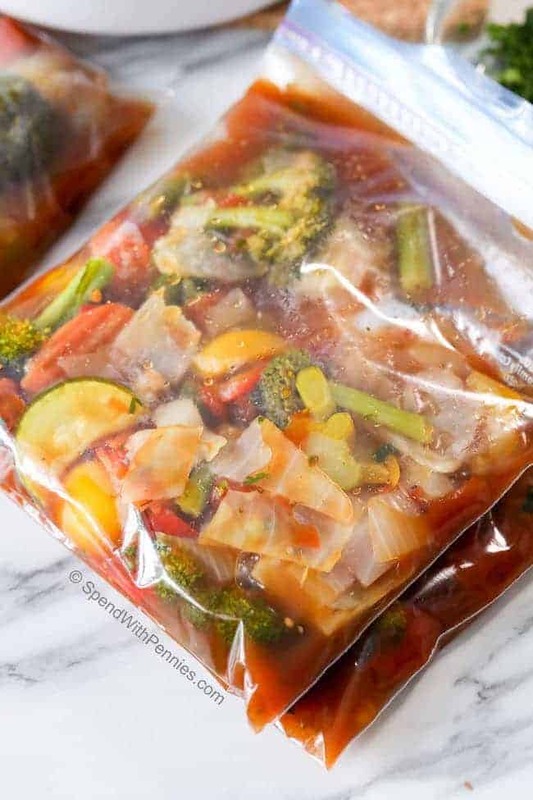 Do you think it could work as a crock pot dish, cooking during the day while at work? Thanks! Brooke, you may enjoy my , and . In any case, I think your idea will work well! I made this soup and it was so bitter that we could not eat it. I did not use the broccoli because I thought it would make the soup bitter (ironically) and used yellow squash instead. Added chopped kale and spinach as well. What did I do wrong? The added greens? It was horrible. Had to throw it away. Wasted so much food! I can’t say for sure as this recipe contains mainly fresh vegetables. If your veggies were bitter this could produce a bitter soup. Oh, Holly is too nice! What/How did I go wrong? I didn’t add this but I added all this other stuff instead…whattya think? Follow the recipe first….then do your thing. Linda, kale is EXTREMELY bitter… Especially for a soup like this. Broccoli would have been just fine. just wondering how big the serving sizes are to get 14 servings from the batch. Each serving is approximately one cup of soup. It was absolutely delicious!!! I feel very privileged that we were there to taste test it! It’s definitely on my list of staples now. I am on the keto diet and this soup is just perfect! I don’t ad carrots instead adding a little more broccoli. Its delicious ,filling and I stay within my daily carb intake. Thanks for a great receipt! So glad you enjoyed it Evelin! I think I can make this soup, blend it and drink it from a cup… much easier when you’re in a hurry or just want it before your actual dinner! Thanks for sharing. I love this receipe however my little guy who is 3 also loves soup.He is not a fan of cooked broccoli and loves peas and corn. So I took part of it, put in a separate pot and added his faves.I also omitted the bell peppers, as I can’t tolerate them cooked and added, cabbage with the core removed..it wasn’t bitter. So glad you enjoyed it! Great idea to add extras for your little guy! My question is, I dont eat cabbage, will it taste ok,? I want to make it. And egg rolls, so I want to eat better, but I dont like peas, califlower,etc. any suggestions? You can use any veggies you like in this recipe. Try this; make a small batch. Cook it. When done, use a stick blender or regular blender (be careful and use a towel to hold the lid in place!) and puree it well. I’ve been learning that sometimes, it’s not the flavor that is bothering us, but the texture. And once pureed well, the tastes tends to blend as well and so no one flavor is more prominent than another. Also, sometimes we don’t care for a veggie prepared one way, but will love it prepared another way. Odd, but how we prepare it, affects not only taste, but texture as well. Another thing is to perhaps change the proportion of things you like/don’t like. So that there’s less “objectionable” veggies and more of those you really like a lot. For extra lean protein, I add cooked ground turkey just before serving. Doesnt change the over all flavor at all. What a great receipe! Sounds yummy, I am so glad you loved it! Oh, by the way, at first I thought it had 31 g fat. lol……….then I saw the -sign………..what does that mean? Yikes, I’m not sure why it was showing -31g of fat (lol, I do wish it had -31g fat though). Thank you for letting me know, I’ve updated the recipe. How much fat per serving is in this recipe? Thanks! This recipe is fat free. Yes, I made this soup in 2016 when I was diagnosed as pre-diabetic. The recipe is big , it took me three days to finish eating it. When I first made this soup I did not print it out , I just made it looking at the computer screen. I’ve been trying to find it since , but I’m glad I found it today. I’ll be sure to print it out for future use. I love this recipe! So glad you found this great recipe again Bev! Great recipe. Omitted the broccoli as I just didn’t have any. No other changes and will make again soon. What is the carb count if I omit diced tomatoes, tomato paste, carrots and green beans? It seems those are the higher carb veggies to cut if I am on the keto diet. Thanks. You can enter your ingredients here to calculate your carbs. It’s free to use! I just made this soup in slow cooker. 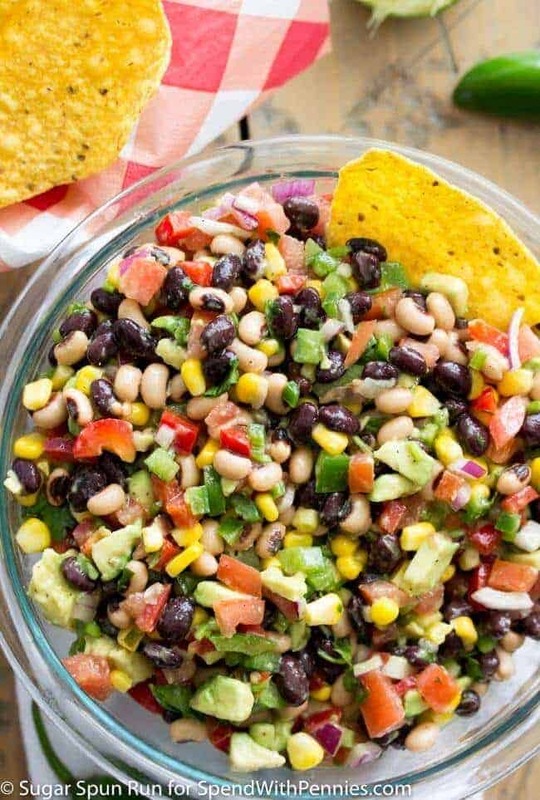 It is absolutely fabulous and with rice or beans as a side dish as a “vegan” you are set ! The only change I made is;instead of 6 cups of beef broth, I used 6 cups of water adding 2 vegetable bouillons. Sounds great Eva, glad you love the soup! Can I substitute the beef broth for chicken broth? Yes, you can use chicken broth. Enjoy, Diane! 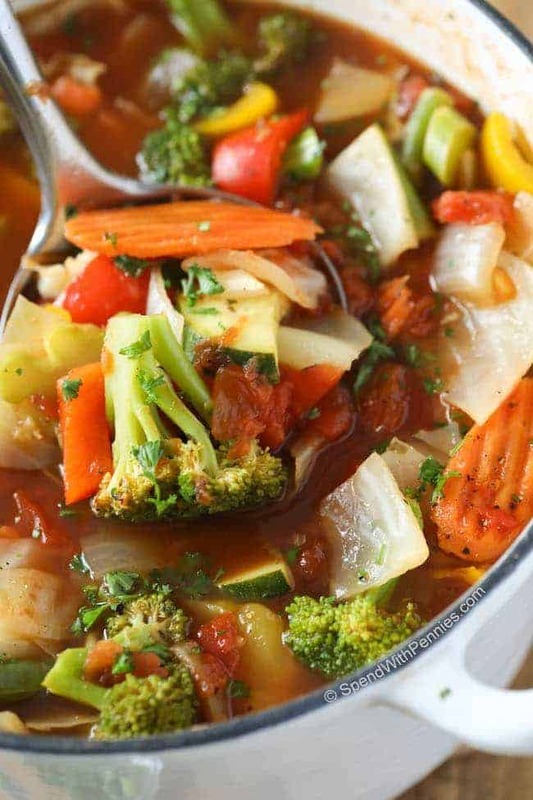 You can also use vegetable broth for a completely vegan and even less calories! I’ve made this recipe a few times, and it’s always good. So glad you love it Florance! This soup is amazing,choc full of veg and very tasty.will make again and again. This soup is absolutely AMAZING!!!! I just made this for the first time, and it turned out great! I did tweak it a bit, though, using chunky tomato sauce that I canned last summer and homemade beef stock. I also used double the garlic, a large vidalia onion instead of small yellow, and added 2 sprigs of fresh thyme, 5 bay leaves, paprika, and crushed red pepper. I’m not normally big on veggie soups, but this has amazing flavor and substance! You could also pretty easily substitute veggie stock (SO easy to make yourself) instead of beef if you wanted to do a vegan version.. Good stuff! Those sound like yummy tweaks to make! I bet it was wonderful with homemade chunky sauce! Very flavorful and super low in calories. Makes a big amount. I haven’t tried it but I would suggest adding them near the beginning so they have a chance to soften. I made this soup yesterday 3/24/2018 I made it exactly like it said for the vetables and broth, but I seasoned it with Italian seasoning and used a level tablespoon of coconut oil to soften the onions. I forgot the bay leaves. It was very good and I will soon be ready to make my second batch. Celery would be a great addition Rebecca! My husband and I just love this soup!!! I remember a soup like this that I still have from WW. So glad to hear that you and your husband love this soup! Glad you two enjoyed it Betty! Excellent soup! I made a few notifications but it turned out excellent and will make it again. I have made this soup several times and it is so good and hearty. I have modified the vegetables and made with chicken broth instead of beef. It is good anyway I make it. Made it before and loved it but can’t remember if I used beef or vegetable broth which I have on hand today . Can I use vegetable broth and get the same result? You certainly can use vegetable broth Amy. It may change the taste a little, but it will work just fine. Oh my goodness. Can’t believe something low in calories can taste so good. Absolutely delicious. Why would a vegetarian recipe include beef broth? That is very odd. This is not a vegetarian recipe. This is a vegetable soup. There is a print button located above the ingredients list. I hope you enjoy it Lisa! 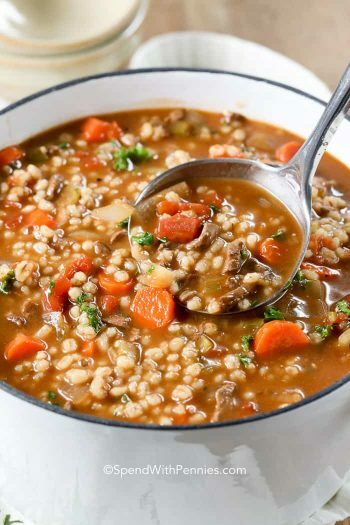 Great soup, I added some lentils in each of the bowls , everyone just loved it, Very filling! This soup was excellent and easy to make. Definitely great for a cold day as a meal or as a snack. The soup was very good! I added potatoes and celery in place of beans. I also added some cornstarch and water to make the broth more thicker. I also added some salt and more pepper. My kids ate some and they couldn’t tell it was homemade . I will make again but maybe I’ll make half of the ingredients as it makes a whole pot full! Happy to hear that your family loved it Lily! This is absolutely delicious and so easy to make. For my husband Iadded some cooked chicken and a piece of Parmesan Cheese rind. That made it even better. I thought it was very good. The beef broth gave it a nice rich flavor. I used a can of tomato sauce instead of the paste because that’s all I had. I added chopped celery because I had some. And I also had quinoa so I added that in before serving. Delicious! I make this at least once a month. It’s the first dish that I’m able to eat and not get sick of. I make this soup all the time! It’s super easy and versatile, you can really use any veggies you have in the fridge. I always try to include the broccoli, green beans and zucchini. Flavorful and healthy for any meal. This soup is sooo good! Love it! whole food looks so yummy, lovely look. Can I leave out the peppers or substitute another vegetable? I don’t care for the taste of bell peppers in anything! Thanks! Can I use rutabaga instead of cabbage. As I’m not a fan of cooked cabbage? You can substitute, this may change the nutritional info. This looks much like the heart health diet from 40+ years ago. Someone at work bring in a crockpot full and we would add to it thru out the week. If you do this put it in the fridge every night. This looks good, it is basically my Veggie Chili Recipe – Except for Basil and Thyme I use Chili powder and Cumin, add kidney beans, subtract cabbage, and no beef broth, but enough water/tomato paste for the right consistency. Thanks for the new idea on making it into a soup! This is one of my favorite soups regardless if I’m on a diet or not! Excellent! This soup is delicious we made it on Wednesday, we made a big stock pot full and I just had some for lunch. Thank you. 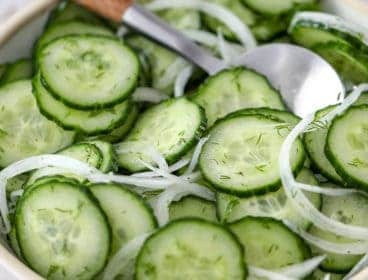 Fabulous healthy recipe! I added some chicken sausage and cheddar for the top and it was scrumptous. Great recipe for a diabetic. I am so glad you enjoyed this recipe Mona! Has anyone tried adding kidney/cannolini beans or something along those lines? Someone above mentioned adding beans and it sounded like it was a hit. I added quinoa and it was delicious. This soup hit the spot, but I blew the serving size it was so good, I had two bowls. I used a slow cooker, so I added 2 additional cups of water and the whole can of paste. I omitted the peppers and added some baby spinach. I had fresh parsley and added that too. It was truly delicious, thank you! These sound like delicious variations! I am glad you liked the soup! I am so glad you have enjoyed this recipe Colleen! If wanting to lose weight, can this be eaten twice a day for lunch and dinner, or just once a day? I used organic veggie broth and did not have cabbage so threw in some corn. It was delicious! Thanks for sharing. Making this tonight. Already made it a couple of times and it was great. This time I added more veggies than the recipe called for, used chicken broth and added chicken. Also add3d quinoa w/mushrooms. Almost Done! I love this recipe! I used chicken broth instead of beef, and added the whole can of tomato paste. It was delicious. Cook on medium for the first part. For simmering, bring to a boil, then reduce the temperature until there are small bubbles. This soup is the perfect vegetable soup, in my opinion. I know you can freeze this soup, but we love it so much, we never have any leftover to freeze! Thank you for such a wonderful recipe! That is often the case with my family too Christina! I am so glad you enjoyed the recipe! How much water should you use to cook the veggies? Simply follow the directions, and the vegetables are cooked right in the soup! Enjoy! Do you used canned green beans or fresh? I use fresh green beans. This was absolutely delicious!! I love to blend all of these veggies in my blender and serve it smooth style!! Great soup!! I used chicken broth and added red kidney beans! My husband loved it! Love this soup. Made today for dinner. My family loved it. Whenever my teen daughter eats 2nds or 3rds I know the meal is a hit. Thank you for the recipe from a happy momma. Love this recipe and while it IS super healthy and packed full of nourishing veggies and vitamins, it is not a 0 point soup, unfortunately, it’s still low, don’t get me wrong! But, when I entered the above nutrition into WW site, it came up with 2 points (smartpoints) per cup. I love this recipe! It’s so healthy and packed full of veggies that are challenging to get into my diet individually. Delicious too! I am so glad you enjoyed this soup! This recipe is delicious!! Just made enough for my work week.. This soup is great. Made it earlier this week and making it again today. Delicious. Thanks for sharing. I made this last weekend and it was fabulous. I added the whole can of tomato paste, added some cauliflower and simmered it longer. Going to make again soon. Love, love, love it. Thanks. you could also add rutabaga if you like would add to it. The brilliance of this recipe is that the soup isn’t over cooked. The more you cook food, you remove the life-force from the food that makes you live longer. Very nice. Hi! I was wondering if there was something I can use in place of the tomato (both the diced and the paste)? Sadly, we can’t use tomato. Just made a huge batch of this & I have to say YUMMMMMMMM! I didn’t measure anything out, just dumped. Added some red pepper flakes & 2 more bay leaves. I don’t think you could put anything in it to even try to make it taste bad. Thank you so much for sharing this. Enjoy! Chicken will be great with it! I love veggies and with fall around the corner, I feel this soup is an easy fix. I followed the recipe exactly, it was easy to prepare and fast to cook. It has a great flavor. I also love it’s low in calories and a diet freebie! To add more spice, I add lemon and tapatio to my bowl. I want to freeze this for meals and snacks ahead of time. How long can I store this is the freezer & fridge? In the fridge, I would not leave it more than 3 days for freshness. Glad to hear! We love it! My husband and I love this soup! However I do love to make recipes my own. I omitted the thyme and basil. I substitute green beans for Garbanza (chick peas). I also omitted the tomato paste since my husband cannot have so much tomatoes. I substituted diced tomatoes for rotel. The perfect recipe!!! Thanks for sharing your recipes! I am so glad you were able to make this recipe work for your families needs and preferences! My husband loves this soup. He asked me to make it a weekly staple in our home. I am so glad your family likes the recipe Mary! Have made this soup several times and love it. My hubby likes it a little spicy so I sometimes add a quarter teaspoon of chilli flakes. I often serve his over some left over rice or pasta and top it off with a teaspoon or so of fresh grated Parmesan cheese. Yummy. What a great idea to use this as an easy topper for rice or pasta! Made this today using marjoram( which i add to most of my beef dishes) , thyme & 2 bay leaves as my seasonings. ..& OMG it’s delicious…I’m a soupy & to have a veg one that doesn’t leave me wanting some noodles, barley, or meat added is fantastic!! Thank you!! & easy to easily found on Myfitnesspal.com too! Made this for my bible study group. It was a big hit ! I am so glad your group enjoyed this recipe Vicki! What can I use instead of the beef broth? I am a vegetarian. Thank you! Vegetable broth should be fine! Made the soup and it was really great. My husband is even eating it, but he added ground turkey. He must have meat. I’m Hooked On This Delicious Soup & Now Cooking More & Sharing With Everyone!!! It’s Too Darn Good Not To Be Shared!!! YUMMY! Thank you Peggy!! I’m so glad you enjoyed it as much as we do! 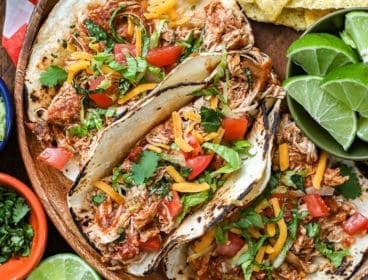 Would this be ok to make in the crock pot? How would you count on 21 day fix? I measure out 1 green of vegetables in my green container and count the broth as free. yes, I did and it was pretty good if I must say myself, I made it for me and cooked my husband something different, I had to make a second batch because he was eating it also. Can’t have onions or garlic-what can I substitute for additional flavor and also what flavorings or spices did you use? You can add in onion or garlic powder, basil, oregano or even Italian seasoning. Put some white or kidney beans in for extra protein. Can fresh tomatoes be used instead of canned? 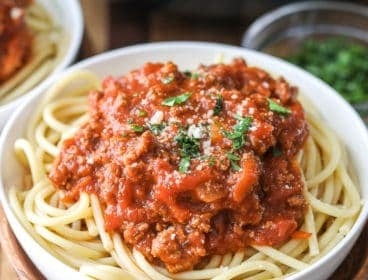 The juices from the canned tomatoes do add a lot of additional flavor so you might need to add some extra tomato paste if you’re skipping the canned tomatoes. 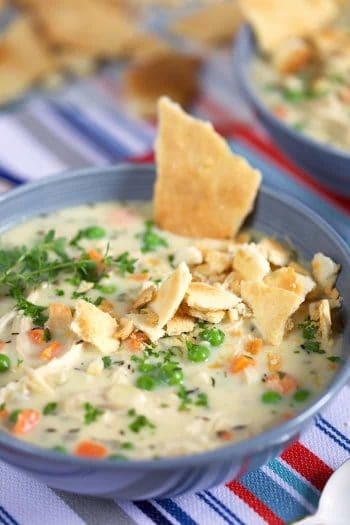 This soup is so good made it all the time then lost therecipe when we moved so glad I scrolled through this site .It gets five stars thanks. I use this soup as a base and add to it,today I made it up as per directions but added some curry powder,Thai seasoning and 1/4 cup of light coconut milk then I blended up half of it and added it back to the mix,also added 1 teaspoon of stevia sugar,yummo. Thank you for the the substitution ideas! Glad you love it. Your changes sound yummy but I got confused when you wrote you blend up half of ‘it’, what is the ‘it’? Half of the veggies and add back to the pot or half of the spices and coconut milk whereas the rest was just added? I’m a visual person and couldn’t quite ‘see’ so I wanted to ask because it all sounds good even blended veggies. Thank you for such exciting recipes. This looks absolutely fantastic! The positive health benefits of the chosen vegetables is tremendous I will certainly be trying this recipe!! You can substitute or you can leave the peppers out. Hey, after freezing how would you reheat? Would you need to defrost first etc? Starting a 40 hour job next week and would like to start taking lunch and this would be perfect. Delicious! Tastes great, and for my girlfriend, no points! For me, I added some leftover chicken and it was delicious for me too! Any suggestions for a cabbage substitution for those that can’t eat it. Looks like a yummy soup! You can leave the cabbage out and replace it with your favorite vegetable. Am I missing something. It gives nutritional values but where does it tell how much a “serving” is? That is necessary. This recipe makes 14 servings which should be about 1 cup each. Really delicious! Used half no Salt added diced tomatoes and half fire roasted crushed tomatoes. Only added a teaspoon of salt total to entire soup and it was perfect. Lots of flavor. Also reheats well on stovetop. 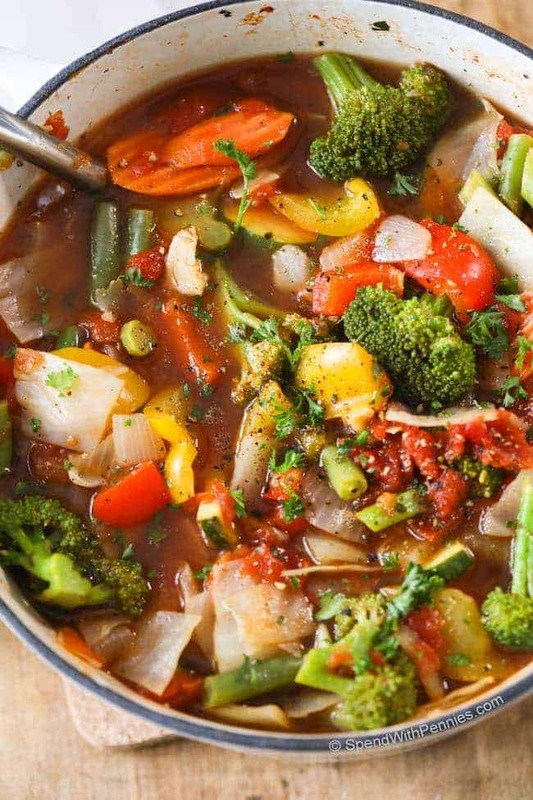 This soup sounds super for me next week it will be Weight Loss Vegetable Soup. Cant wait to try it. I recently started the every other day diet and this soup is perfect for the modified fasting days. It fills me up, keeps me satisfied, and is healthy to boot! I add a little hot sauce with each bowl and it gives it a nice little kick! Really need to make this soup. Looks good! As I read the directions and watched the video , I noticed that it stated to cook the onions and garlic first. Cook it in what ? Butter, margarine, oil, or just in a dry pot? Is there a non fat oil, butter or margarine. I was just wondering how to get it started. Thanks for your time. YOUR SOUP LOOKS SO GOOD , WILL TRY!!!! Ok, how do you start cooking the onions and garlic? Spray the pot? Or do you start with a certain amount of water in the pot? Do you know what the exchange is for 21 day fix meal plan users? Thank you. I scoop out 1 green of vegetables and the broth is free. My question is for the skinny soup with vegetables, is that all you can eat for a week? If not what do you suggest I have for breakfast or lunch? I personally use it to fill me up in between and before meals. :) It doesn’t have all of the nutrients you’d need for the week (like protein, fats and carbohydrates). Absolutely love this soup. I added the tri colored spiral pasta at the end and a couple more seasonings, used veggie broth as I’m vegetarian and it’s amazing. Been eating it every day, can’t get enough! Thank you so much. What could I substitute for the cabbage? Doesn’t agree with me. You can substitute any vegetable in this soup. Can I blend the entire soup in a vitamix? I have kids that think vegetables are out to get them. I think that is a great idea for how to get the kids to have some veggies and like it! Can I use Chicken broth instead of beef? Smiling as i have found You Holly! <3 So happy to have you join me Cindra Lou! Many thanks for the recipe of Skinny Chicken Alfredo. The taste of this dish is amazing. Do you think this could be made easily in a crock pot instead? Yes! A low setting should work while stirring occasionally. Do you have a measurement conversion chart? What’s a cup in grams please, everything I google gives me different quantities. Each vegetable will have a different weight in a 1 cup measure. This particular recipe is flexible if your measurements aren’t exact. 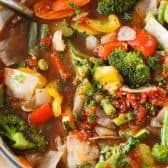 About WEIGHT LOSS VEGETABLE SOUP RECIPE How Can you Call it vegetable when you use beef broth, in it in sted of vege broth? It is a vegetable soup, not a vegetarian soup. :) You can certainly substitute any type of broth you’d like. We’re so glad you liked it! How would I log this into my weight watchers? This soup is free (0 pts) as the vegetables and broth are both free items. Just made this yummy soup. added tsp. of celery seed and cayenne pepper! Thanks for the recipe! You say fix approved… do you know the serving size & count/color containers it is? I fill my green with veggies (1 green) and then put them into a bowl and top with broth (which is free). Do you know the containers for 21DF that this uses? I fill 1 green container with vegetables (1 green) and place it in a bowl. Top with broth as desired (free item). Excited to try this and read your blog! Thanks for stopping by! Happy that you’re here! I have seen the recipe for the Cabbage soup diet, I have to agree it is packed with sodium. I always prefer fresh veggies in my soup! Not only is i tastier, but so much healthier. I hope you get a chance to try this recipe Kenn. Thanks for stopping by! If this is being called vegetable soup, why use beef broth? Why not use vegetable broth? This is a vegetable soup, not a vegetarian soup. I use beef broth because I prefer the flavor but you can certainly substitute vegetable soup if you prefer. Yummy! Planning this for the weekend, since snow will be coming in! Love your recipes but hate how hard you make it to print or even save in pinterest. There is a print button to the right of the ingredients list. 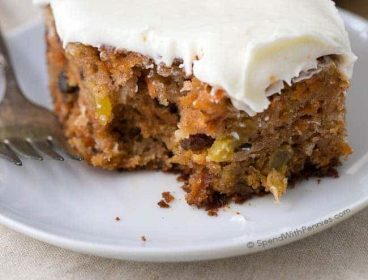 You can hover any photo on a computer to pin or you can repin this recipe here. I had just talked to a friend about a soup to start our diet this sound great. This is an amazing and delicious soup. I made it today and shared with my family. Was wondering if I could use a bag of cole slaw instead of chopping up the cabbage? Same thing? Just curious. That is a brilliant idea Linda! Just finished simmering this soup with my own blend of seasonings. It smells phenomenal, can’t wait to sit down and enjoy it. Can I replace the beef broth with chicken broth? what is the serving size for 58 calories? I had a little olive oil when I sauté my onions and garlic, otherwise it always burns on me. I’m surprised the recipe doesn’t call for something to cook with them. My boys and I Love this soup. I didn’t have any thyme so I added basil and oregano. Also I didn’t have the tomato paste, found it didn’t need it anyways. Thank you for this amazing recipe! I am NOT a fan of veggies at all, but I made this for the first time and it is AMAZING. I’m still amazed how good it is. Very simple to make as well. Definitely won’t be the last time I make this. I made this soup tonight and it is delicious! I cooked it longer than stated in the directions because I wanted the veggies to be more tender and it turned out great. You’re welcome! I’m happy to hear that you enjoyed it! I have a strange question. Can this soup be pureed, or can the veggies be very finely chopped in a processor before cooking? I have a texture issue with most cooked veggies, but I want the nutrients and fiber. Thanks! Yes, you can fine chop the veggies if that works for you. Can I puree the weight loss soup after I cook it? I am vegetarian and this looks like heaven!! We are replacing with Vegetable broth and adding some mushrooms and a little extra stuff!! Perfect for rainy weather!! Thanks for the great recipe!! Where do you get vegetable broth at? I don’t eat beef or pork. Black beans would be great in this! Enjoy! How many days can i eat this soup? Can i eat o la that? This is an awesome recipe. Do you know how long it will keep in the frig? I keep it for about 5 days. Can I add more broth or even water? I tried your veggie soup AND my family loves it. Thank you so much!! I bought the ingredients to make this soup and wondering how I can be done in 6-7 min and the vegtables be done? You’re going to cook the onions in step 1 first and then add the veggies in step 2 and cook for 5 minutes. You’ll add broth in step 3 and cook for 6-7 minutes and then additional veggies for another 5 minutes. The total will be about 28 minutes. How crunchy are the veggies suppose to be? You can cook them as little as you like if you prefer them crunchy or cook it longer if you prefer them softer. Going to try that tomorrow. Made it tonight and my almost 2 year old grandson loved it also. I will make this again. Thank you for sharing this with me and family. How long soul it last in the freezer? Sorry I’ve never really been one to freeze stuff line soup so I’d like to know…. It will keep for up to 6 months (although it never lasts that long for me :) ). when it says 6 cups of beef broth…..is that beef cubes melted with water??? You can use boullion cube with water. I personally used boxed broth. Ok this may be a really stupid question…. I’m not much of a cook so bare with me….. I love love love sour cabbage… can u use that in this instead of regular cabbage? Would u have to do anything diffferent? I haven’t tried this recipe with sour cabbage so I can’t say for sure how it would change the recipe. If you do try it, please let us know how it turns out for you! The amount listed in the recipe is correct. In the video I had basil, thyme and pepper combined all in one little bowl and added it all at once. I also added a sprinkle of parsley. Love your recipes, can you send some good ones for people with diabetes ? I have a question. In the beginning when you cook the onions and garlic what prevents it from burning since there is no liquid in there and when you add the cabbage, carrots and green beans with no liquid or oil base what makes these vegetable get tender? I can’t digest raw or partially cooked veggies and have to have them cooked nearly tender. Depending on your pan, you can add a spray of cooking spray, a little bit of olive oil or even some broth if needed. Love the several recipes that I read anxious to get on the list !! Love this soup! I added celery, parsely, a few more garlic cloves and yellow squash! I also used diced italian herbed marzano tomato’s. It is very flavorful and I could eat it all day long! Thanks for the recipe! Great additions! Thank you for sharing! Why isn’t a list of seasonings included with this video posting or the printed version? The seasonings are listed in the recipe. You can add a sprinkle of fresh parsley or herbs as well if desired. Just wanted to add that making your own vegetable stock is really easy. Save all of your veg scraps – you can store i nfreezer until you have enough. Too much cabbage, zucchini and broccoli for my husband’s diet…Warfarin and those veggies don’t mix so well. Sounds good to me though. Frozen or can? I would like to use fresh and frozen. This recipe uses fresh. I’m sure you could successfully substitute some frozen as well. I make this soup, but use rotel tomatoes, celery and lots of cabbage as I love cabbage plus all the other raw veggies in a slow cooker. Love the addition of Rotel! Thank you for sharing! What seasoning are being use in this soup? Doesnt say in the ingredients list. Thyme, basil and pepper are the seasonings listed in the recipe. You can also add in a sprinkle of parsley or fresh herbs. Can I use frozen vegetables? Fresh veggies would taste better, but frozen is okay to use! Wow, awesome and tasty too‼. Thanks for helping me fine healty meals. I used Rotel tomatoes for the diced tomatoes giving a wee bit of spice. Also used some frozen mixed vegetables along with broccoli, cauliflower and a small amount of new red potatoes. I now call it the “to die for weight loss” soup. . Thank you so much for sharing the recipe. This soup is delicious. As a change, I replace the tomatoes with a can of Rotel tomatoes, I like spicy. I’m a Lifetime Member of WW (25 years), so I’ve changed this soup up a lot. I have only made the soup as written so I haven’t tried substituting the cabbage. Since a large portion of this soup is made up of cabbage, you’ll need something with bulk such as kale or extra zucchini (or even zucchini noodles). Spinach is another great addition although it doesn’t have as much bulk. I love this soup. It’s so versatile, you really cannot mess it up. I add a cup of spicy v-8 for added kick. It’s perfect when you’re feeling a bit fluffy. That sounds like a tasty idea! GREAT IDEA! Ithink Iwill use the bloody mary mixes Ihave . I am not a big Bloody Mary Fan. Thanks for the use! Have lost my printer in a flood and have not had time to replace it yet but would love to save this recipe for future. You can save it by pinning it to your Pinterest board if you have a Pinterest account. You could also copy the recipe into an email that you send to yourself with the subject line “Weight Loss Vegetable Soup” (or whatever you want to call it). Then just email it to yourself! When you’re ready to make it, just pull up your email account and search for the name and there it is! And whenever you get a new printer, you can simply print your email. I have updated the post with the information. Please note that this is based on my own calculations using the brands and ingredients I have used, your soup may vary slightly. (This is for informational purposes only and is not to be considered medical advice). Dorothy, you can check out Holly’s Easy Low Carb website for more low carb recipes! I scoop the veggies to fill my green container and then ladle the broth (which is free) on top. I count this as 1 green. I have never tried bell peppers for soup before. Interesting. I will put that in my next batch. I had planned vegetable soup for tomorrow’s lunch/dinner. New Years resolution to lose weight, as usual. What did you pour over it at the last second? Looks like soy sauce or something.. also, any suggestions – I used a lot of frozen veggies & I feel it’s real bland. The only thing added at the last second was a sprinkle of pepper from a pepper grinder. If you have fresh herbs, they’re great added in just before serving. I find beef broth adds way more flavor than chicken broth. I see that it’s 0 WW points but do you know the calories per serving? Thank you! Weight loss soup looks real. Its something I will try. I tried this and loved it ever since! I make huge pots and freeze in single servings. I love love love this soup!!! And i have dropped quite a few lbs eating this instead of chips or other junk. I even pureed some and used it as broth to drink at work on days when i won’t get a lunch break. Thanks for the recipe! I’m so glad you loved it! I’ll have to try a puree for when I’m on the go! What do your soup recipes consider a serving size to be? This recipe makes 14 1 cup servings. I can’t eat this w/w skinny soup as it has broccoli in it and I’m highly allergic to broccoli, can I substiute the broccoli for a different vegetable??? Absolutely! You can add whatever veggies you like. I used boxed ready to serve beef broth (reduced sodium). I haven’t tried this in the slow cooker however I’m sure it would work just fine. I would suggest adding the zucchini and broccoli about 30 minutes before serving so they don’t get mushy. Can’t have tomatoes- does that change the soup that much? No, you can substitute whatever veggies that you like! I made it tonight for dinner. My husband loved it. I had to add ground turkey. He’s a meat eater. Sounds like the perfect addition! How many carbs are in the soup? Thank you so much for the recipe!! My mind is all really spinning on what other things’s I can throw in with!! What if you wanted to have more like a bowl of soup at a time instead of just a cup? What if you wanted to have a bowl of soup instead of just a cup? Does this soup clean you out just like the weight watchers soup does? This soup is low in calories and I often eat more than a cup to make a meal out of it. I have to change to way i eat because of my cholesterol, so i would assume that this would be good for it. If I wanted to lose weight with the weight loss soup would it be OK to do two meal replacement shakes during the day and the soup for my dinner? I would suggest contacting your doctor. I am unable to provide medical advice. This is a very good soup and looks beautiful. My dad was a good cook and he always made this but added lean ground beef that had been browned but his secret ingredient was V8 Juise in place of the beef broth. Not sure what that would do to the calories but the flavor was good! Thank you for sharing you recipe! You’re welcome! Thanks for trying it out! and can I purchase it? I’m sorry, I do not have a book available for purchase at this time. Any idea of actual nutritional content? I am going to try these soups. Looks so yummy and the best thing is healthy. Would you have a suggestion of a substitution for the cabbage? I love everything else in the recipe but I am really not a fan of cabbage. I have only made the soup as written so I haven’t tried substituting the cabbage. 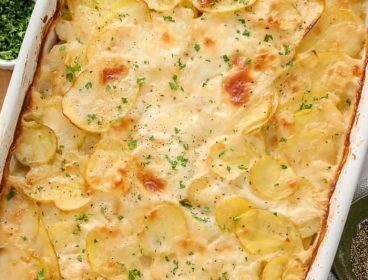 That would definitely work however note that potatoes are higher in carbs and calories than cabbage so this will change the nutritional value substantially. What is the carb count on this? I am going to make this today. I really want to try this recipe! It looks delicious. I follow 21 Day Fix. Do you know which containers a serving counts as? This is one green. I fill my green with the veggies and then ladle the broth (which is free) over top. I really dont like cabbage. Im wondering if it will work without it. I am seriously overweight and a very picky eater in terms of flavour. 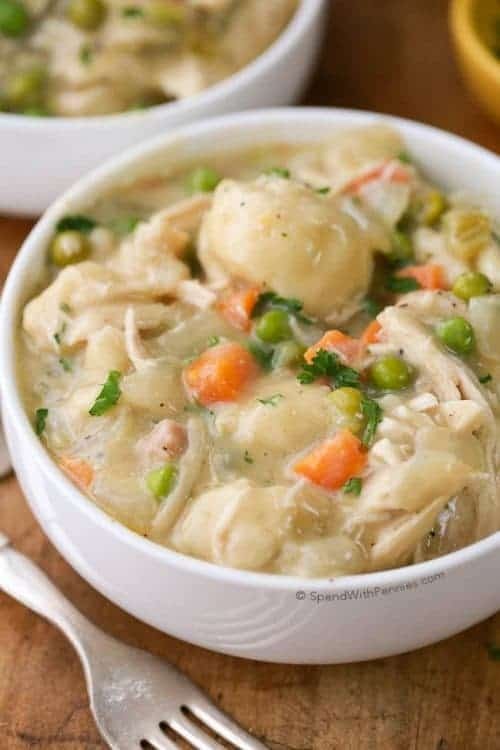 Im wondering if I make this soup without the cabbage and use the 1 cup servings as you suggest, how much chicken can I add and still have it “healthy”? The definition of healthy may vary depending on your own personal goals. 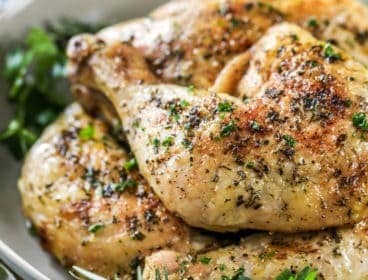 I do consider lean chicken (such as roasted or grilled chicken breasts) to be healthy and I personally would add about 2-3oz of lean chicken per serving. This is really good and I am on my second day. When I weighed this morning I was down 1 lb. weight watchers would call this zero points. When you are eating basically no carbs or fat you will lose. Good luck. What do you cook the onions and garlic in? Oil? Butter? You can use a non stick pan or cooking spray (or even a little bit of broth) just to keep them from sticking. Can it be made with chicken stock instead of beef broth as the beef broth has preservatives which I am allergic to? Yes, you can use chicken stock. What is “21 day fix”? 21 Day Fix is a portion controlled eating plan and exercise plan. You can find some information on it here. Crazy question i LOVE All the veggies except I HATE cabbage! LOL can I substitute that for anything else? Or is it really not that noticeable? I have only made the soup as written so I haven’t tried substituting the cabbage. Since a large portion of this soup is made up of cabbage, you’ll need something with bulk such as kale or extra zucchini (or even zucchini noodles). Spinach is another great addition although it doesn’t have as much bulk. So glad you loved it Carolyn! How long will this keep in the refrigerator? I made it today and it’s delicious! I’m do glad you loved it Stephanie. I usually keep it about 4-5 days and if it’s going to be longer than that I freeze it. 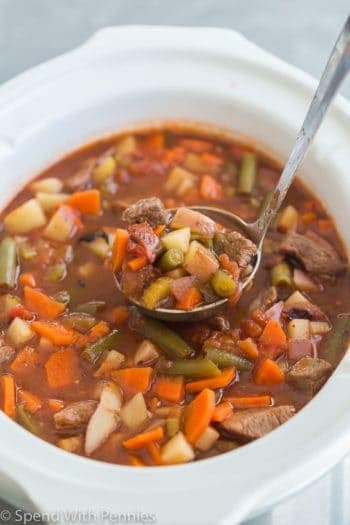 about your Weight Loss Vegetable Soup Recipe how many carbs per serving? Do you by chance know what containers/how many in a serving it uses for 21 day fix? Since its just vegetables, I would fill your green container with the veggies (1 green) and broth is free so you can just ladle broth overtop. Enjoy! I a man having trouble pinning your great recipes from my IPhone. What am I doing wrong? I love your recipes. Hmm.. I’m not sure. What device are you using? What would be the carb count on this? My diabetic doctor has me counting carbs to insulin ratio. Thank you for posting! This sounds wonderful (except for the broccoli)! I love homemade soups. That it’s healthy is a big plus!! I can not eat cabbage, what can I substitute? Try adding your favorite vegetable instead. Absolutely. Any vegetable will work in this recipe. Have you done this in a slow cooker? I haven’t but I think it would work just fine! I would suggest adding the zucchini and broccoli about 30 minutes before it’s done so they don’t get mushy. I’m on weight watchers I will make this soup looks healthy. This is perfect for Weight Watchers! can you use veg stock to make it vegetarian friendly? Do I have to add bay leaves and thyme …can I add chicken and still had the same effect? You do not have to add the bay leaves and thyme, they are added just for flavor. You can add chicken to make this a complete meal. Does anyone know how long it will keep when frozen? I made the soup tonight with no salt added canned tomatoes and green beans, still had loads of flavor without the sodium. It filled 15 containers for the freezer, each holds a 1.5 cup serving :) I love the recipe, thanks for sharing! I keep them up to 3 months. I freeze it in containers, then pop it pop it out of the container (still frozen). Then I vacuum seal it. Keeps up to a year or longer and tastes just as fresh as when you made it. Do you have the nutritional information for this soup? It looks great and im strictly counting my calories however I’m not familiar with the weight watcher’s point system. Hi,is weight loss soup suitable for a low carb diet?. It could be suitable for a low carb diet depending on what vegetables you put in it. You can calculate the nutritional information at MyFitnessPal.com to see if it’s a fit for you! Katie, you can check out Holly’s Easy Low Carb website for more low carb recipes! How manny calories in 1 cup serving? What if I don’t have bay leaf or tyme/basil? You can leave them out or substitute other herbs you may have on hand. They are just there to add extra flavor. Thank you for sharing with us different varieties of soups that is very good for weight loss. The soup looks so inviting and tempting. As i am a carb n calorie watcher. I am definitely going to try this soup. Thank you in advance. How many calories is in a cup of weight loss vegetable soup? Can you substitute the bell peppers for cauliflower? Absolutely! That would work perfectly! This soup looks delicious!! Do you have an idea of what the calorie count is per serving? According to MyFitnessPal.com this recipe has about 112 calories per serving. This can vary slightly based on the items you use. The recipe has it cooking so quickly I’m just wondering how it will work if you want to cook it in the slow cooker? I haven’t tried it in the slow cooker. I’d love to hear how it works out if you do try it! This soup does great in the slow cooker. I do mine on low and it is ready when I get home. I’m not a great cook so I have to ask how long do you cook it in the crock pot? Low temp usually 6-8 hrs, if that. But if you’re working, I’d put just a little extra liquid so it doesn’t go dry on you. Those green tabs are awful. They are in the way and when I try to tak a photo of the recipe I end up having to take extras as I can only see a small art of the recipe at a time. Plesae move them. Thanks. Thank you for letting me know. I had some recent site updates and just learned of this problem. I have someone looking at it today. This soup is wonderful! We added extra lean ground turkey and a cup of chopped celery. What do you consider a serving of this soup – 1 cup? Great additions to make it a heartier meal! Yes, the serving size is 1 cup. Did you use red cabbage? I made it and it was extremely bitter. I am wondering what I did wrong. Any ideas? When cabbage is boiled it will turn bitter. Red cabbage will retain its color and have a great taste if not boiled. Ive never had regular cabbage turn bitter i boil it a lot, & love it with corned beef. Ive never had cabbage turn bitter on me either.. Its always cooked up to a slight sweet natural taste to me. When using cabbage, make sure to remove the core. The core is bitter. Otherwise cabbage should not be bitter at all. I just wanted to weigh in… when you cook or saute garlic too long it can take on a bitter taste as well. I always add my garlic towards the end of my cooking. I’ve never had issues with cabbage being bitter. Ground turkey!!! Yes! I’m making this tonight my daughter loves her veggies, but she likes to have meat with it too. So going to add ground turkey tonight when we make this with all the snow, thanks! 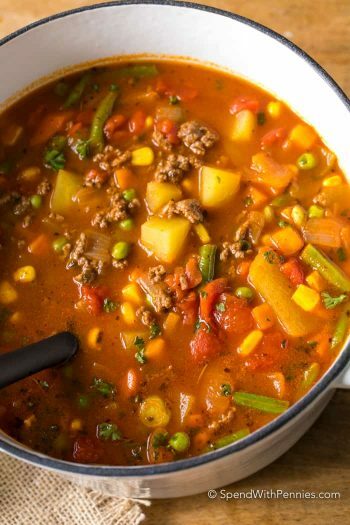 This soup looks so hearty and comforting! I love being able to freeze soup for later, too since I live alone. Beautiful photographs! These recipes look wonderful. I’m going try them all. This soup is gorgeous! And whether it’s for weight loss or not, I could eat it every day! It’s like how I eat my salads (with tons of veggies in them) but in soup form, love it! Thank you Averie! It’s one of my favorites too! Is that all you ate for 8 days ? When you ate it for 8 days did you just eat the soup or add other meals? How did you make the cabbage soup? You ne to eat bananas if you eat too much cabbage soup. A lot of acid. U can Google Cleveland clinic cabbage soup diet, they also have a 3 day diet as well. ZERO WW points?! That’s just plain amazing <3 I'm in love with this colorful soup! Can this be made in crockpot Holly? It is about 1 cup. This soup is fantastic AND beautiful!! Thank you!